Discover the opulent lifestyle that only exists with waterfront homes for sale and real estate listings in Austin, Texas! Contact The Berkshire Hathaway Home Services Team and find out why they are the waterfront real estate specialists. Trying to find that perfect waterfront home in Austin can be a tiring ordeal and can sometimes feel like you’re paddling against the current. There’s a lot to look at when purchasing a waterfront home; water access, usage regulations and even whether your property is boat accessible. With The Berkshire Hathaway Team on your side, our waterfront real estate experts can help with all your questions and put you in that dream waterfront home! Find out more about luxury lakeside living in Austin waterfront homes for sale. See all of the waterfront and water access properties and start your waterfront real estate search today. Read more about the waterfront lifestyle or browse the current listings. You'll find our website to be a one-stop resource for your waterfront home research. We're eager to tell you what we know about the local market for condos or homes, pre-construction, or whatever is most interesting at the moment—that's where you'll usually find us! Just knowing that you want a waterfront home isn’t enough. There’s a myriad of things to consider before you jump in feet first to that opulent lakeside property. Knowing where to look is one thing, but knowing what to look for in Austin waterfront homes for sale is another. There are many considerations that you need to look at like water regulations, whether there is limited access to the water, where the nearest boat launch is, even whether or not you can build your own private dock for your boat. There’s just as many questions as there are options in purchasing waterfront real estate. Berkshire Hathaway has the knowledge, experience and insider information that is sure to put you in your luxurious waterfront home. We have years of experience in waterfront homes and real estate and know what it takes make your waterfront dreams come true. Contact us today and be the first to know when a home that meets your needs and desires comes available. The city of Austin is bisected by the beautiful flowing waters of the mighty Colorado river. The scenic river has cut a deep impression in the Texan landscape, in turn creating some of the area's most sublime views, and setting the stage for some of the city's most iconic architecture. Homes like these can be found along sections of river that have widened out to create lakes. 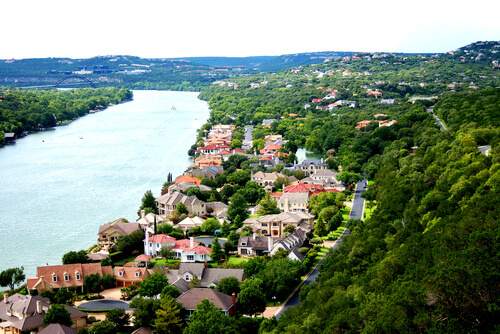 This includes popular local hot spots like Lady Bird Lake, Lake Austin and Lake Travis. Lake Austin can be defined as the 20-mile stretch of the Colorado River that weaves its way directly into the highly desirable downtown Austin neighborhoods. These neighborhoods and the properties that line the banks of the lake are among the city's most high-end, while maintaining fantatic and convenient access to the downtown core. Lake Travis is the snaking reservoir of the Colorado River located just northwest of the city of Austin. It's banks provide an impressive 65 miles of picturesque water frontage. Several popular smaller communities have popped up along the banks of the lake as well, including Volente, Lago Vista and Spicewood. What Property Types Are Available? All Austin waterfront properties share similar and beautiful views of the region's lakes and rivers. The property types vary quite widely though, depending on their position along the river. Older estate homes in classic central Austin neighborhoods like Tarrytown and Clarksville embody an old-world aesthetic in their real estate. Newer master-planned communities further outside Austin offer a greater variety of real estate, including newer single-family homes and condominium developments with appealing resort-style amenities. 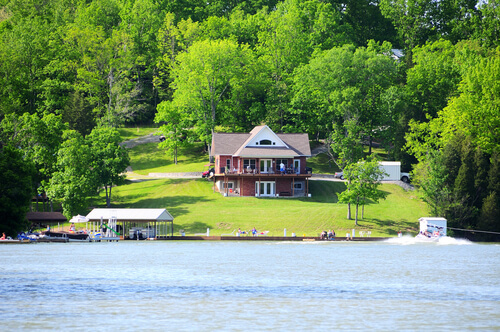 We can help you find your dream lakeside, waterfront or water access luxury home or land. Call us at (512) 483-6000 or contact Berkshire Hathaway HomeServices online and an Austin waterfront real estate specialist from our team will contact you directly.